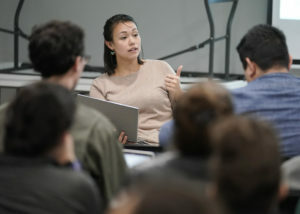 Georgetown Law Students, Faculty, Alumni Assist Migrants Seeking Asylum in U.S. The South Texas Family Residential Center in remote Dilley, Texas, is hard to find and hard to get to. Located 80 miles southwest of San Antonio, it is the largest family detention center in the United States, with capacity for 2,400 women and children awaiting the possibility of an asylum hearing. Dilley Pro Bono Attorney Cindy Woods (L’15). Roughly 1,700 people are detained there now. In order to have any hope of a successful asylum claim, these people need legal representation. But first, they usually undergo a credible fear interview in which they tell the story of why they fled their home countries and why they believe they cannot safely return. 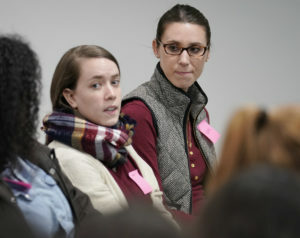 That’s where volunteers come in — like the 14 from Georgetown Law’s Human Rights Institute who spent five days of their winter break in Dilley, helping the women prepare for those interviews and learn how to find a pro bono attorney. 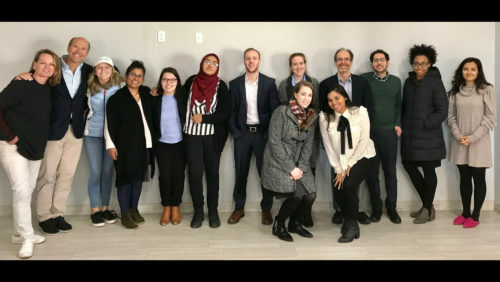 The Georgetown group worked in teams — one Spanish speaker paired with a non-Spanish speaker — under the supervision of staff from the American Immigration Lawyers Association (AILA) and the Dilley Pro Bono Project, including Cindy Woods (L’15). Nikki Endsley (L’19), who helped to organize the trip, is interested in pursuing asylum and human rights law and has represented asylum seekers in the Washington, D.C., area. She previously helped to organize a trip to a detention facility in Jenna, Louisiana, with the Southern Poverty Law Center, and she has done refugee work in France, Greece and Turkey. 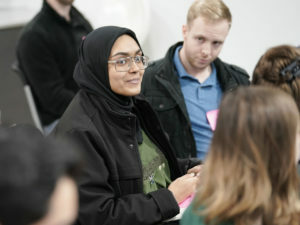 Sabiya Ahamed (L’20), Austin Rose (L’21). Some students were disturbed by the color-coded attire the women and children — even the babies — were given to wear. And all expressed concern for the health of the detained women and children, most of whom were sick — exhausted by their arduous journeys and from spending time in what the migrants call the “ice boxes,” frigid cells they are put in immediately after being detained, sometimes while still wet from crossing the Rio Grande. Endsley said this was a particularly maddening aspect of the experience — the federal government and ICE officials blaming the women and children for their ill health. The trip was sponsored by then-U.S. Rep. John Delaney (D-Md. )(L’88) and April McClain-Delaney (L’89), who visited the facility and the Georgetown Law students in Texas on January 3. The Delaneys made a $40,000 gift to the Georgetown Human Rights Institute to subsidize the December trip and a spring trip to the Karnes County Residential Center, another ICE detention facility in Texas. McClain-Delaney volunteered legal services the day they spent at Dilley. John Delaney had visited the border previously as part of a congressional delegation. He was moved by the encounters he had with migrants in Dilley and on the previous trip, and he believes that we must respond more compassionately and constructively to the influx of people from Latin America. Sam Lambroza (L’19) donated significant funding through his family foundation, the Burke-Lambroza Charitable Trust, which supports programs or organizations that have an immediate or direct impact on the lives of individuals. 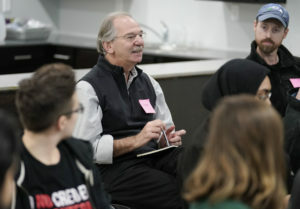 Lambroza, a businessman and former professor, believes experience is the most important part of studying the law and that direct representation is an experience every student should have. All in the Georgetown group have been watching the news from the border and wondering what they could do to help. 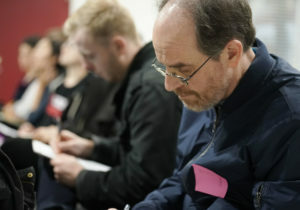 His fellow participants also felt called to do something about the plight of asylum seekers and to test their legal skills in the process. “I feel like it’s such a privilege that we have the opportunity and the qualifications to offer this type of help to families,” said Karen Baker, a clinical teaching fellow and supervising attorney in Georgetown Law’s Center for Applied Legal Studies (CALS). Kristen Blosser (L’20) and Karen Baker. Professor from Practice Andrew Schoenholtz, who helped plan the Dilley trip, said it was important that students who haven’t been to a detention facility get that experience. Photos: Before meeting clients, Georgetown Law’s Human Rights Institute volunteers participate in an orientation meeting on Sunday, December 30, 2018, in Dilley, Texas (Darren Abate/AP Images for Georgetown Law).